The RMX330 is excellent for stability stacking and holds 6 drums worth of product in the space of 4. The RMX330 is ideal for high bay warehousing storage. 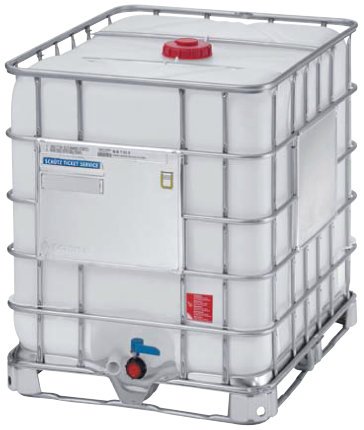 Our 330 Gallon totes have new tote bottle, reconditioned cage and pallet. The patented geometrical features of the bottom plate ensure the highest degree of stability and minimum residual contents. 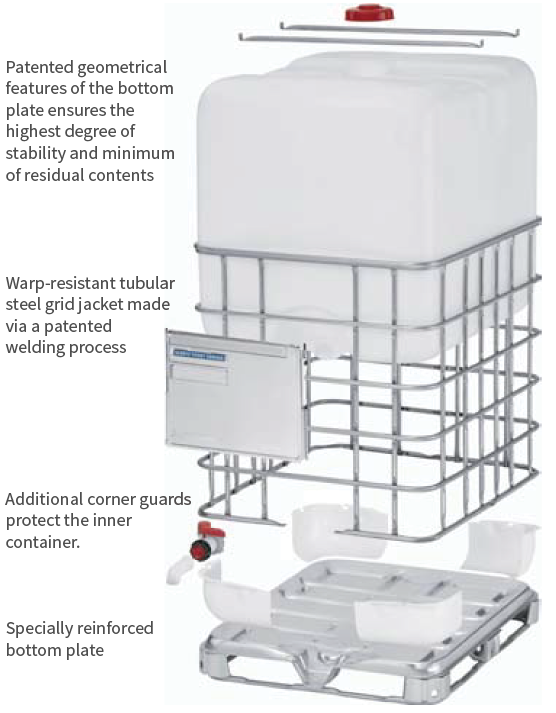 The RMX330 is available in a variety of equipment packages and approved for filling of goods up to a maximum density of 1.9. Safeguarded from extraneous effects. The specially reinforced bottom plate coupled with the warp resistant tubular steel grid jacket, made via a patented welding process, perfectly safeguard the RMX330 from any extraneous effects. Corner guards made of polyethylene further protect the inner container. Multi-trip capabilities to protect the environment. The Container Technology, unique retrieval, and reconditioning system helps to preserve resources and protect natural foundations of life. Filled ECOBULK according to the specific weight of the filling goods.